After I'd switched from the Google Maps API to Leaflet get my trail map working on my own website, the next step was to move it to the Nature Center's website to replace the broken Google Maps version. PEEC, unfortunately for me, uses Wordpress (on the theory that this makes it easier for volunteers and non-technical staff to add content). I am not a Wordpress person at all; to me, systems like Wordpress and Drupal mostly add obstacles that mean standard HTML doesn't work right and has to be modified in nonstandard ways. This was a case in point. But in a Wordpress website, the <body> tag comes from Wordpress, so you can't edit it to add an onload. A web search found lots of people wanting body onloads, and they had found all sorts of elaborate ruses to get around the problem. Most of the solutions seemed like they involved editing site-wide Wordpress files to add special case behavior depending on the page name. That sounded brittle, especially on a site where I'm not the Wordpress administrator: would I have to figure this out all over again every time Wordpress got upgraded? * to init_trailmap(). This is a wordaround to dynamically add that tag. Complicated, but it's a nice trick; and it let us switch to Leaflet and get the PEEC interactive Los Alamos area trail map working again. Google Maps API No Longer Free? A while ago I wrote an interactive trail map page for the PEEC nature center website. At the time, I wanted to use an open library, like OpenLayers or Leaflet; but there were no good sources of satellite/aerial map tiles at the time. The only one I found didn't work because they had a big blank area anywhere near LANL -- maybe because of the restricted airspace around the Lab. Anyway, I figured people would want a satellite option, so I used Google Maps instead despite its much more frustrating API. New pricing and product changes will go into effect starting June 11, 2018. For more information, check out the Guide for Existing Users. That has a button for "Transition Tool" which, when you click it, won't tell you anything about the new pricing structure until you've already set up a billing account. Um ... no thanks, Google. Googling for google maps api billing led to a page headed "Pricing that scales to fit your needs", which has an elaborate pricing structure listing a whole bnch of variants (I have no idea which of these I was using), of which the first $200/month is free. But since they insist on setting up a billing account, I'd probably have to give them a credit card number -- which one? My personal credit card, for a page that isn't even on my site? Does the nonprofit nature center even have a credit card? How many of these API calls is their site likely to get in a month, and what are the chances of going over the limit? It all rubbed me the wrong way, especially when the context of "Your trail maps page that real people actually use has broken without warning, and will be held hostage until you give usa credit card number". This is what one gets for using a supposedly free (as in beer) library that's not Free open source software. So I replaced Google with the excellent open source Leaflet library, which, as a bonus, has much better documentation than Google Maps. (It's not that Google's documentation is poorly written; it's that they keep changing their APIs, but there's no way to tell the dozen or so different APIs apart because they're all just called "Maps", so when you search for documentation you're almost guaranteed to get something that stopped working six years ago -- but the documentation is still there making it look like it's still valid.) And I was happy to discover that, in the time since I originally set up the trailmap page, some open providers of aerial/satellite map tiles have appeared. So we can use open source and have a satellite view. Our trail map is back online with Leaflet, and with any luck, this time it will keep working. PEEC Los Alamos Area Trail Map. But meanwhile, I've been giving lots of presentations, tweaking the code, tweaking the CSS to make it display better. And every now and then I get reminded that a few other people besides me are using this stuff. For instance, around a year ago, I gave a talk where nearly all the slides were just images. Silly to have to make a separate HTML file to go with each image. Why not just have one file, img.html, that can show different images? So I wrote some code that lets you go to a URL like img.html?pix/whizzyphoto.jpg, and it will display it properly, and the Next and Previous slide links will still work. Of course, I tweak this software mainly when I have a talk coming up. I've been working lately on my SCALE talk, coming up on January 22: Fun with Linux and Devices (be ready for some fun Arduino demos!) Sometimes when I overload on talk preparation, I procrastinate by hacking the software instead of the content of the actual talk. So I've added some nice changes just in the past few weeks. For instance, the speaker notes that remind me of where I am in the talk and what's coming next. I didn't have any way to add notes on image slides. But I need them on those slides, too -- so I added that. Then I decided it was silly not to have some sort of automatic reminder of what the next slide was. Why should I have to put it in the speaker notes by hand? So that went in too. And now I've done the less fun part -- collecting it all together and documenting the new additions. So if you're using my HTML/JS slide kit -- or if you think you might be interested in something like that as an alternative to Powerpoint or Libre Office Presenter -- check out the presentation I have explaining the package, including the new features. My Linux Planet article last week was on printing pretty calendars. But I hit one bug in Photo Calendar. It had a HTML file chooser for picking an image ... and when I chose an image and clicked Select to use it. it got the pathname wrong every time. I poked into the code (Photo Calendar's code turned out to be exceptionally clean and well documented) and found that it was expecting to get the pathname from the file input element's value attribute. But input.File.value was just returning the filename, foo.jpg, instead of the full pathname, /home/user/Images/yosemite/foo.jpg. So when the app tried to make it into a file:/// URL, it ended up pointing to the wrong place. Perhaps this is even reasonable, given how common cross-site scripting bugs have been in browsers lately -- maybe running a local script really is a security risk if you have other tabs active. But it leaves us with the problem of what to do about apps that need to do things like choose a local image file, then display it. And it turns out there is: a data URL. Take the entire contents of the file (ouch) and create a URL out of those contents, then set the src attribute of the image to that. Of course, that makes for a long, horrifying, unreadable URL -- but the user never has to see that part. I suspect it's also horribly memory intensive -- the image has to be loaded into memory anyway, to display it, but is Firefox also translating all of that to a URL-legal syntax? Obviously, any real app using this technique had better keep an eye on memory consumption. But meanwhile, it fixes Photo Calendar's file button. Here's a working minimal demo of using getAsDataURL() with a file input. The catch? It didn't do anything -- except print console is not defined. After some searching and poking around, we determined that Firefox also has console.log -- it's just well hidden and a bit hard to get going. Run Firebug and click to the Console tab. Now click on the tiny arrow that shows up at the right edge of that tab, as shown. Turns out there's a whole menu of options under there -- one of which is Enabled. Here are some more things you can do with Firebug's console. I'm not a big fan of URL-shortening services -- I like to see what page I'm about to load so I know if I want to go there. But with Twitter's 160-character limit, URL shorteners become necessary. It's tiresome to type in bit.ly every time, so I wanted a bookmark to say "give me a shortened version of the current URL". Surprisingly, I had a hard time finding one. bit.ly itself has one on their front page, but it didn't work for me. Upon examination, it looks like their bookmark wants to read the clipboard, so you'd have to select a URL first before shortening it (though they don't actually tell you that). I don't want that extra step, so I made my own. Actually two of them. The only problem with that is that I'd rather have the option of opening it in a new tab, so I can continue to read the original page. Normally I open new tabs by typing in a URL and typing Ctrl-Return (normally it's Alt-Return in Firefox, but it drives me nuts that Firefox uses Ctrl-click for new tab but Alt-Return and I can never keep them straight, and Firefox's normal behavior for Ctrl-Return is brain-dead useless so that's the first thing I fix when I get a Firefox update). With this bitly bookmarklet, Ctrl-Return and Alt-Return don't work -- because then you lose the original tab's URL, and bitly gives you a shortened URL to nowhere ... "nowhere" being defined, in the bitly universe, as http://about.com (go figure). What to do? Ctrl-Return (or Alt-Return) to open in a new tab. I'm not sure which one I'll end up using more, but I'll obviously change the bitly2 name to something better if I end up using it a lot. If you want to use either of these bookmarklets: right-click on the link and choose Bookmark this link. 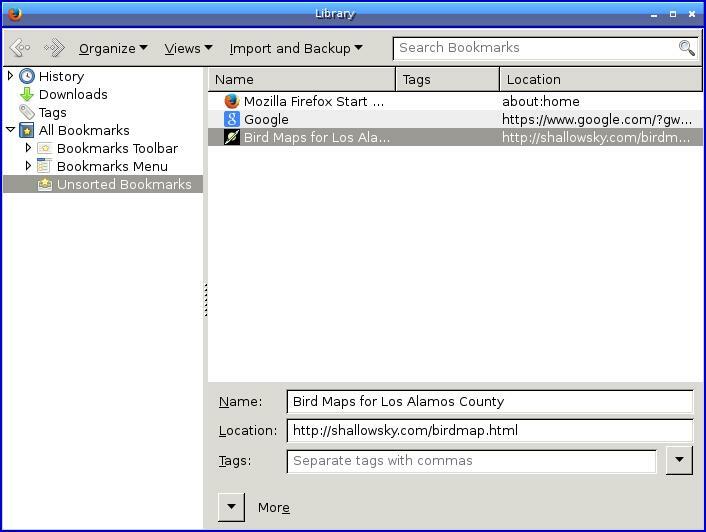 Then, alas, since Firefox still doesn't let you enter a keyword in its Bookmarks dialog, you have to go to Bookmarks->Organize Bookmarks, find the bookmarklet you just added and click on it, click on More, and finally you can give it a keyword. My mom, immediately upon seeing it, unerringly zeroed in on the biggest missing feature I'd been trying to ignore. "Can you make it go faster or slower?" It's a sickness, I tell you. It's not like I needed another Jupiter's moons application. I've already written more or less the same app for four platforms. I don't use the Java web version, Juplet, very much any more, because I often have Java disabled or missing. And I don't use my Zaurus any more so Juplet for Zaurus isn't very relevant. But I can always call up my Xlib or PalmOS Jupiter's moons app if I need to check on those Galilean moons. They work fine. Another version would be really pointless. A waste of time. ... and before you know it, it's tomorrow and you have something that's almost a working app, and it's just really a shame to get that far and not finish it at least to the point where you can share it. ... and your Saturday morning is gone forever, and there's not much you can do about that, but at least you have a nice animated Jupiter's moons (and shadows) page when the sickness passes and you can finally think about other things.